So much I want to say about Barker Lane, but mainly I want to share these photos of its changed state. It’s not 1950 down here anymore — it’s definitely 2013. The transformation of the ‘Harvey-Scruton’ buildings is complete. 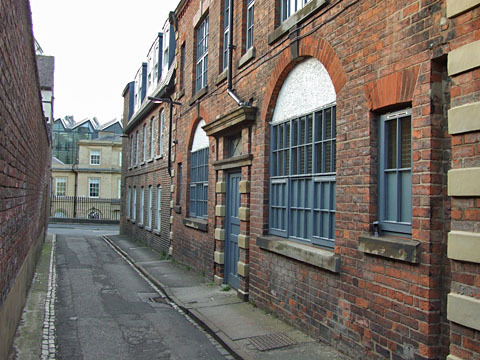 These buildings were not listed, but they’ve been preserved anyway, which is very pleasing. 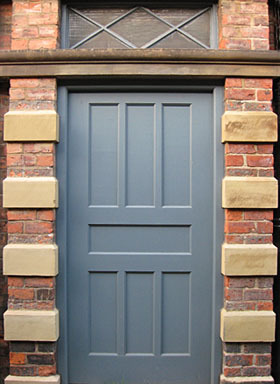 That handsome doorway is still there, with better paintwork. 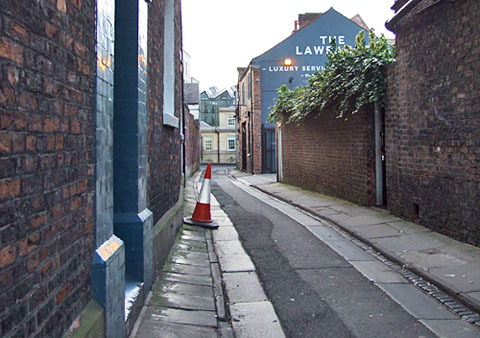 This lane and these buildings were included on an early page, back in 2004, and looked the same for many years, until recently. I hope it doesn’t sound daft to say that I had a strong feeling of ‘connection’ to this place. Yes, it does look daft. But, anyway. I’ve no idea why. Maybe one of my York ancestors lived along here at one time. Who knows. Maybe it ’speaks’ to a lot of people, not just me. It’s special, is Barker Lane. That, of course, is because it’s an ancient lane. And all our ancient lanes have special qualities a thoroughfare like Parliament Street doesn’t have. More on that another time perhaps. 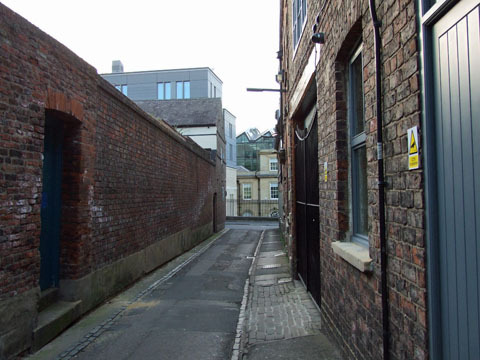 The Micklegate end of it looks much the same, and the Harvey Scruton buildings are preserved, but this narrow ancient lane has been changed at its Tanner Row/Toft Green end by the enormous grey bulk of a new hotel built next to the transformed West Offices. It seems to loom over Barker Lane, light-blocking. These photos were taken in the evening, when the light was low anyway. I’ll try to revisit and get photos when the sun is higher in the sky, but for now these will have to do, as this page is long overdue. The changes here seem to encapsulate the wider changes in this city, the cultural shifts, changes of emphasis. At the junction where Barker Lane meets Tanner Row and Toft Green, the old red brick walls overshadowed by the large hotel with its brand displayed in red plastic lettering, the new kid on the block. In the background, the 19th century railway station/railway offices (West Offices) sensitively restored as the council headquarters for the 21st century. Behind me, where a small local business once manufactured pharmaceutical products, a change of use. To ‘residential’, kind of, in a short-term way. It’s very classy. 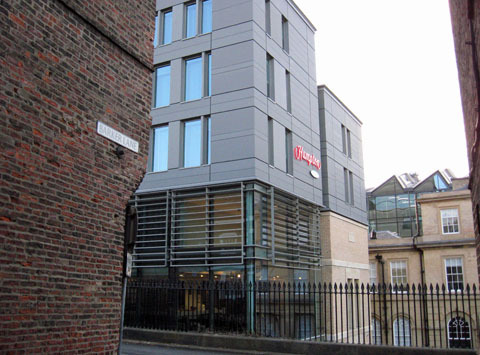 I’m no expert, but now I’ve read many of the planning application documents and admired the handsome Barker Lane frontage it looks like this was an imaginative and thoughtful redevelopment, respecting that ‘sense of place’ I keep trying to record on these pages. … and deserves a page of its own.